Erya 爾雅 "Approaching the correct" is a dictionary-like glossary from the Han period 漢 (206 BCE-220 CE). It is one of the Thirteen Confucian Classics. The author is not known. Traditionally authorship is attributed so some of Confucius' disciples who compiled the Erya in order to elucidate the meaning of terms appearing in the classical texts. It is also claimed that the Duke of Zhou 周公 (11th cent. BCE) had begun to compile such a book which was later expanded by Confucius, his disciple Zixia 子夏 and the early Han scholar Shusun Tong 叔孫通. In fact the Erya must have been compiled during the Former Han period 前漢 (206 BCE-8 CE) by members of the National University (taixue 太學) entrusted with the teaching of the Confucian Classics. The title signifies that the book provides the proper meaning of terms, as Confucius stressed it in his concept of rectifying names (zhengming 正名) in order to achieve a well-functioning political and social system. Beginning of the Erya, Sibu congkan 四部叢刊 edition, reproducing a Song period print from the collection of the family Qu 瞿氏 from Changshu 常熟, Jiangsu (Tieqin Tongjian Studio 鐵琴銅劍樓). Click to enlarge. The lexemes are arranged according to 19 semantic fields or chapters, in 3 juan. Each chapter title begins with the word shi 釋 "explaining" (lexemes of this and that field). The titles of the first three chapters are interpreted by commentators as (1) "Explaining old (meanings, 詁=古)", (2) "Explaining (elegant and ancient) words", and (3) "Explaining instructions (mostly from the Shijing 詩經, used to define proper modes of behaviour)". The lexemes are arranged in groups of synonyms, for which reason the Erya can be called a synonymicon. Yet this only refers to part of the Erya. Other parts, mainly in the second half, contain lexicographic definitions (like the names for horses in the example below), others include ritual prescriptions (as can be seen in the use of exact terms in kinship in the example below). The Erya shows that it belongs to a group of other texts compiled during the Han period, like Cai Yong's 蔡邕 Duduan 獨斷. 初，哉，首，基，肇，祖，元，胎，俶，落，權輿，始也。 Beginning, sprout (哉=才), head (首), base (基), to open a door (肇), ancestor (祖), origin (元, actually the head of a child coming out of the mother's womb), embryo (胎), to set in (俶), to begin anew (落), to be created and start to move (權輿, of the universe) - [all this] means "to start" (始). 典，彝，法，則，刑，範，矩，庸，恆，律，戛，職，秩，常也。 Canon (典), bronze vessel (彝, with an inscription of a law text), standard (法), rule (則), punishment (刑, shape 形), mould (範), ruler (矩), regular (庸), long-lasting (恆), pitch pipe (律), custom (戛), official post (職), sequence (秩) - [all these] mean "regular" (常). 勞，來，強，事，謂，翦，篲，勤也。 To labour (勞), to encourage oneself (來), to force (強), to serve (事), to apply oneself (謂), to make efforts (翦), to sweep (篲), [all this] means "to be industrious" (勤). 殷、齊、中也。斯、誃、離也。 To bring into a straight form (殷), to treat as a navel (齊=臍), means "to center" (中). To split open (斯), to split off (誃), means "to separate" (離). 謖、興、起也。還、復、返也。 To get up (謖), to rise (興), means "to set in" (起). To return (還), to go and come back (復), means to revert (返). 明明、斤斤、察也。 To clarify (明明), to ponder (斤斤), means "to investigate" (察). 條條、秩秩、智也。 To do something orderly (條條), to observe a sequence (秩秩), means "to have insight" (智). 穆穆、肅肅、敬也。 To do something respectful (穆穆), to act solemnly (肅肅), means "to pay deference" (敬). 婦稱夫之父曰舅，稱夫之母曰姑。姑舅在，則曰君舅、君姑；沒，則曰先舅、先姑。謂夫之庶母為少姑。 A wife calls the husband of her father jiu 舅, and his mother gu 姑. As long as they live, they are to be addressed junjiu 君舅 and jungu 君姑, after passing away, the terms of reference are xianjiu 先舅 and xiangu 先姑. A concubine of the husband's father is called shaogu 少姑. 四骹皆白，驓。[...]後右足白，驤。[...]尾白，駺。 A horse with four white ankles is called ceng 驓, [...] one with a white right hind leg, xiang 驤, [...] one with a white tail, lang 駺. Translation according to the Modern Chinese one in Xu and Mei (1995). The earliest commentaries on the Erya were written by the Later Han 後漢 (25-220 CE) scholars Liu Xin 劉歆, Mao Guang 樊光, Liu Xunji 劉巡幾 and the Wei period 曹魏 (220-265) scholar Sun Yan 孫炎. All of these early commentaries are lost. 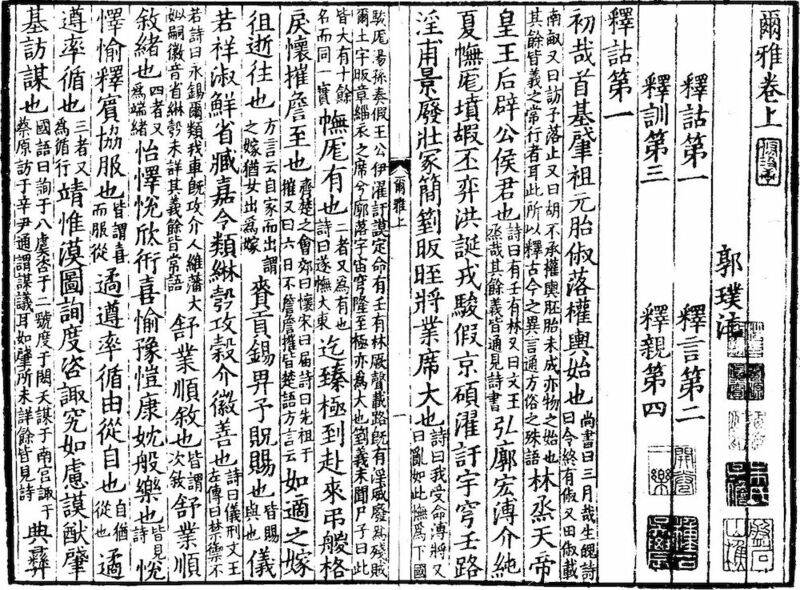 The earliest surviving commentary, Erya zhu 爾雅注 in 3 juan, was written by the Eastern Jin 東晉 (317-420) scholar Guo Pu 郭璞. Guo Pu had also compiled phonetic glosses, Erya yinyi 爾雅音義, which is lost. Lu Deming 陸德明, the famous Tang period 唐 (618-907) commentator, compiled a phonetic exegesis, Erya yinyi 爾雅音義. The Song period 宋 (960-1279) scholar Xing Bing 郉昺 expanded this commentary on the 10-juan long Erya shu 爾雅疏. His contemporary Zheng Qiao 鄭樵 wrote a new Erya zhu, in which he stressed that the older commentators did not get to the point directly and were too ambigous in their explanations. Luo Yuan 羅願 wrote a kind of supplement to the Erya called Eryayi 爾雅翼 "Wings to the Erya", which focuses on plants and animals. There were a number of commentaries in the subsequent centuries with different purposes. Some were textual-critical amendations of earlier writings, like the commentaries of Ruan Yuan 阮元 (Erya zhushu jiaokanji 爾雅注疏校勘記) and Yan Yuanzhao 嚴元照 (Erya kuangming 爾雅匡名), others were supplements, like Zhou Chun's 周春 Erya buzhu 爾雅補注, some were real commentaries, like Shao Jinhan's 邵晉涵 Erya zhengyi 爾雅正義 or Hao Yixing's 郝懿行 Erya Guozhu zhengyi 爾雅郭注正義, and some books were interpretations of the basic principles of the structure of the Erya, like Chen Yushu's 陳玉澍 Erya shili 爾雅釋例 or Wang Guowei's 王國維 explanation on the plants and animals chapters of the Erya. The discipline of "Erya studies" (yaxue 雅學, in ancient times also called cang-ya zhi xue 倉雅之學, including the Erya and the primer Cangjiepian 倉頡篇) gained such prominence that Hu Yuanyu 胡元玉 (dates unknown, late 19th cent.) wrote a "meta-study" on this discipline, the Yaxue kao 雅學考. The Erya and its glossary style founded a whole type of glossary dictionaries compiled with similar principles. Some of them were explicitly written as supplements to the Erya, like Zhang Yi's 張揖 Guangya 廣雅, others only took the Erya as a model, like Zhou Mouhan's 朱謀㙔 Pianya 駢雅. Li Xueqin 李學勤, Lü Wenyu 呂文郁, ed. (1996). Siku da cidian 四庫大辭典 (Changchun: Jilin daxue chubanshe), Vol. 2, 634. Xu Xinghai 徐興海, Liu Jianli 劉建麗, ed. (2000). Rujia wenhua cidian 儒家文化辭典 (Zhengzhou: Zhongzhou guji chubanshe), 143. Zhang Dake 張大可 (1988). "Erya 爾雅", in Zhang Jihui 趙吉惠, Guo Hou'an 郭厚安, ed., Zhongguo ruxue cidian 中國儒學辭典 (Shenyang: Liaoning renmin chubanshe), 395. Zhong Jinghua 鍾敬華 (1992). "Erya 爾雅", in Zhou Gucheng 周谷城, ed., Zhongguo xueshu mingzhu tiyao 中國學術名著提要, Yuyan wenzi 語言文字卷 (Shanghai: Fudan daxue chubanshe), 153. Zhou Zumo 周祖謨 (1988). "Erya 爾雅", in Zhongguo da baike quanshu 中國大百科全書, Yuyan wenzi 語言•文字 (Beijing/Shanghai: Zhongguo da baike quanshu chubanshe), 65-66. Coblin, Weldon South (1972). "An Introductory Study of Textual and Linguistic Problems in Erh-ya" (Ph.D. Diss., University of Washington). Coblin, W. South (1993). "Erh ya", in Michael Loewe, ed., Early Chinese Texts: A Bibliographical Guide (Berkeley: Society for the Study of Early China: Institute of East Asian Studies, University of California). Li Qian 李倩, Luo Ling 羅凌 (2009). "Songdai yaxue de tedian ji qi xungu chengjiu 宋代雅學的特點及其訓詁成就", Zhonghua wenhua luntan 中華文化論壇, 2009/2. Shen Xiaolong 申小龍 (1998). "Yaxue shi lunwang 雅學術史論網", Nanjing shehui kexue 南京社會科學, 1998/6: 8. Von Rosthorn, Arthur (1975). "The Erh-ya and Other Synonymicons", Journal of the Chinese Language Teachers Association, 10/3: 137–145. Yang Qilu 揚啟魯 (2009). "'Yaxue' kao '雅學'考", Huaxia wenhua 華夏文化, 2009/2. Zhao Shiju 趙世舉 (1993). "Yaxue yu wenhua lunwang 雅學與文化論網", Gu Hanyu yanjiu 古漢語究, 1993/1. Zhou Zumo 周祖謨 (1988). "Yaxue 雅學", Zhongguo da baike quanshu 中國大百科全書, Yuyan wenzi 語言•文字 (Beijing/Shanghai: Zhongguo da baike quanshu chubanshe), 437.